Microvia drilling is a means of creating holes between conductive layers of a printed circuit board (PCB) which are then typically electroplated to create a conductive path through the substrate to connect 2 or more layers of circuitry. A UV laser is used to drill through copper and substrate layers by using precisely controlled laser parameters (power, frequency, pulse width, etcetera) in order to optimize the drilling performance for the different material types in a laminated PCB stack-up. The most common PCB materials which require microvia drilling are flexible circuits composed of an organic polyimide substrate bonded between conductive copper layers to provide electrical insulation between the two conducting copper layers. Traditional rigid PCBs and High Density Interconnect devices also require plated microvias for connecting to internal layers. Through-holes which connect all layers of a PCB from top to bottom surfaces. Buried vias which connect only internal layers of a multilayer PCB, but don’t connect all the way through to exterior top/bottom surfaces. Blind vias which connect from an exterior top/bottom layer to an internal layer, but do not penetrate through the entire board. Lower drill speed when compared to mechanical drilling. The main disadvantage of the mechanical drilling of a microvia is the requirement to control the drilling in the Z direction very tightly and to be reproducible. Microvias allow for increased density of circuitry design. Microvias are critical for reducing the size of PCBs by allowing for multiple circuit layers to be stacked on top of one another, rather than spreading out over a large single layer. 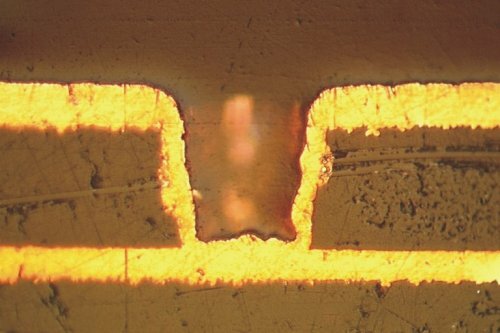 Laser energy can be precisely controlled in order to stop at internal copper layers (in the case of blind or buried vias) much more effectively than a mechanical drill. This ability to control the penetration depth of the laser in the Z axis is highly repeatable. Positional accuracy of a laser-drilled via is significantly better than a mechanically-drilled via due to the elimination of “wander” from a mechanical drill bit. Lasers eliminate the cost of consumable tooling required for mechanically-drilled systems. 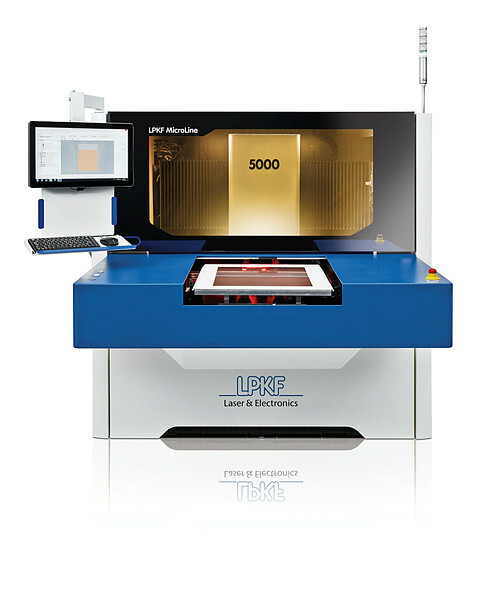 LPKF’s Microline 5000 series is the flex PCB industry’s answer to high throughput, high-yield drilling applications. Common applications include the drilling of through-holes and blind vias, with the additional ability to cut large mounting holes, or full perimeter cuts of irregular board contours. LPKF’s new generation of microvia drilling lasers are achieving throughput speeds never before seen in the industry. New drilling techniques are being employed to improve this existing, but long-neglected method. The historical industry leader has not done much to improve the technology for years – LPKF is changing that. Laser market leaders don’t always treat their small customers well. Many industry leaders jump at the chance to work with Flextronics, Foxconn, or Apple, meanwhile, smaller customers are often neglected. With a world-wide service network, LPKF customers can speak to a live support technician anytime, 24/7. There is no laser with a better price/performance ratio on the world-wide market today.